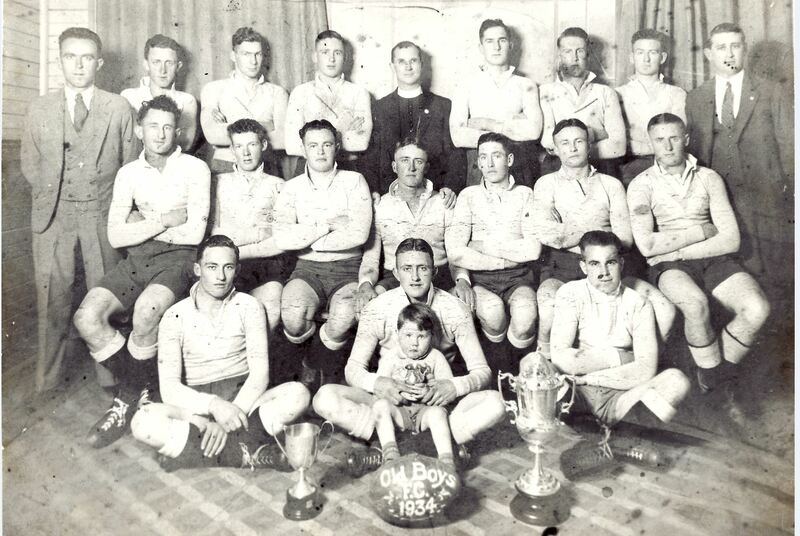 Cootamundra De La Salle Old Boys 1934. football talent. At least 10 of these boys plus their coach represented in the Maher Cup: from back left to right: Jack Chapman (trainer), B. Hudson, Hugh Kennedy, Des Ewen, Brother Xavier, Des Kennedy, Jack Ewen, Ray Mangan, Herb Schofield (coach); middle row: F. Barrett, L. Lloyd, Stan Roberts, Ted Faulkner (capt), Jim Quinlan, Jack Walsh, Ted Mangan, Frank Holder, Roy Faulkner, Fred Davis. Photo courtesy Mick Ewen.